Porcelain veneers can be utilized to improve the appearance of a number of tooth imperfections, including stains, chips, gaps, and more. At Dental Professionals of Fair Lawn, our highly-trained and experienced dental team can customize this popular treatment to resemble the look and feel of your natural teeth while providing durable, long-lasting results. 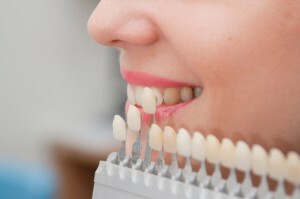 Additionally, veneers can be designed to match the color, shape, and size of your surrounding teeth. With daVinci™ porcelain veneers, our cosmetic dentist can restore form and function to your teeth and help you achieve a beautiful new smile. To find out if porcelain veneers can help you meet your goals, please contact Dental Professionals of Fair Lawn and schedule an appointment with one of our cosmetic dentists. Ultimately, porcelain veneers can mask common dental flaws to restore the proportions and shade of a youthful and healthy tooth structure. Furthermore, this minimally invasive cosmetic solution often allows patients with inconsistencies in tooth symmetry to achieve an even, uniform smile. What is the Porcelain Veneers Treatment Like? Once it has been determined that you are a good candidate for daVinci™ porcelain veneers, a digital impression of your teeth will be made in order to ensure the utmost precision for the design and construction of your veneer. Rather than creating an impression with messy pastes and adhesives, our advanced computer imaging system will map out an exact model of your teeth while you are relaxing comfortably in your chair. Our cosmetic dentist will then prepare the treated tooth by removing a very small portion of enamel to accommodate placement of the veneer. Utilizing a durable porcelain material, your custom veneer will be thinly constructed to match the specific size and shape necessary for the most comfortable and natural fit over your tooth. Once your porcelain veneer is crafted and ready for bonding, it will be secured to your tooth using a strong cement and tinted to match the color of your surrounding teeth. Following a final polish, your veneer should look, function, and feel like a natural tooth. Porcelain veneers typically produce long-lasting results, often spanning decades. Thanks to their durable porcelain composition, daVinci™ veneers can be very enduring with routine oral hygiene habits. No additional maintenance besides daily brushing and flossing, as well as routine dental check-ups and cleanings, is typically necessary to keep porcelain veneers in good condition. Taking care to avoid excessive clenching, grinding, or pressure on the teeth can also prevent unnecessary damage to the veneer and further prolong their usefulness. Patient reviews from RealSelf.com place the national average cost of porcelain veneers treatment at approximately $7,000, although a cost estimate for your procedure cannot be accurately calculated until your needs are assessed during a consultation. Prior to the start of any dental work, a member of our team will provide you with a complete price breakdown as well as a personalized quote. In addition to accepting all major modes of payment—including cash, checks, and credit cards—our practice also works with premier healthcare lending companies, such as CareCredit® and ALPHAEON® Credit. These highly reputable dental financing options offer a range of low- to no-interest payment plans for qualified applicants that can be chosen to suit your budgetary concerns. Please don’t hesitate to reach out to our practice for any other questions you may have regarding the cost of porcelain veneers. Are There Any Alternatives to Porcelain Veneers? Our Fair Lawn dentists offer several other treatments that can serve as cosmetic fixes for common dental concerns such as yellowing of the teeth, misalignments, and cracks in the tooth structure. If staining is your main concern, professional teeth whitening is one of the easiest ways to powerfully lighten the shade of your smile. Furthermore, misalignments in the teeth can be corrected discreetly with cosmetic orthodontic systems like Invisalign® or Six Month Smiles®. Small chips in the enamel are often effectively addressed with cosmetic bonding, which layers a durable bonding material to the affected tooth in order to repair the area. The region is then molded to blend in seamlessly with the proportions of your tooth structure. While this solution is not usually as long-lasting as porcelain veneers, cosmetic bonding can be a relatively simple technique to restore the entirety of a chipped tooth. In addition, a porcelain crown can be a beautiful restoration to repair tooth damage that is too extensive for cosmetic bonding. These “caps” are designed to cover a tooth in order to strengthen it, as well as protect against further injury or decay. While crowns can add aesthetic benefits to your smile, they are primarily used to rebuild a weak tooth structure. While most insurance plans do not cover porcelain veneers due to their classification as an elective cosmetic procedure, every patient’s policy differs. Our front office would be happy to check your insurance plan to determine whether you are eligible for partial or full coverage of the costs. The dental-grade porcelain used to craft your veneers is designed to be exceptionally strong, often lasting 15 to 20 years with regular oral hygiene. With that said, if you grind or clench your teeth at night, it may benefit you to sleep with a custom night guard in order to prevent unnecessary pressure on the veneer. Since there is very little natural tooth enamel removed during the porcelain veneers process, patients usually report little to no discomfort during treatment. After the veneer is bonded to the front of your tooth, wearing it should cause no pain and the dental appliance should look and feel natural. The porcelain material used in cosmetic dentistry is generally stain-resistant and impervious to the effects of wine, coffee, alcohol, blueberries, and other agents known to cause discoloration. Whitening or bleaching treatments typically aren’t effective on porcelain veneers, as the porcelain material is denser than natural teeth. Fortunately, veneers are also very difficult to stain and often remain color-stable throughout the years. Is treatment with porcelain veneers reversible? As a small amount of enamel must be removed to support a natural fit for the veneer, the procedure is not usually reversible. However, when placed by an experienced dentist, porcelain veneers typically provide a stunning result that retains high rates of patient satisfaction. For more information regarding porcelain veneers, or to schedule a consultation with one of our cosmetic dentists, please contact Dental Professionals of Fair Lawn.